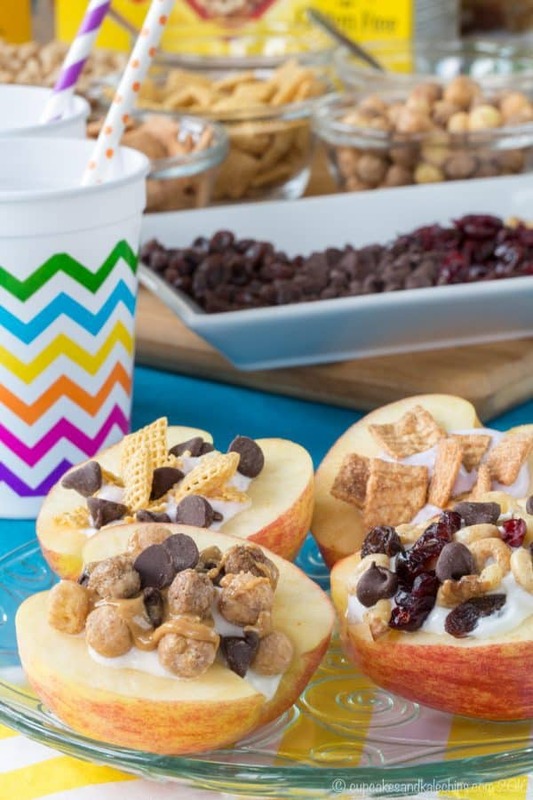 Easy, wholesome after-school snacks to have ready for hungry kids. Try these eight ideas or create your own. 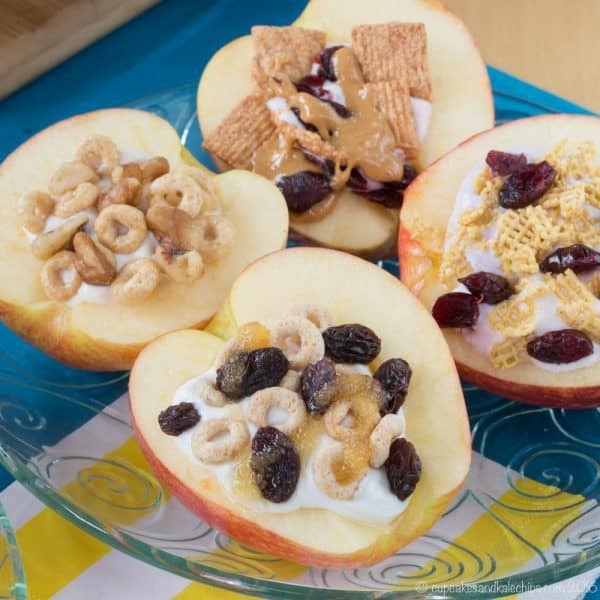 Cereal and Yogurt Stuffed Apples are an easy way to have wholesome after-school snacks ready for hungry kids when they get off the bus. 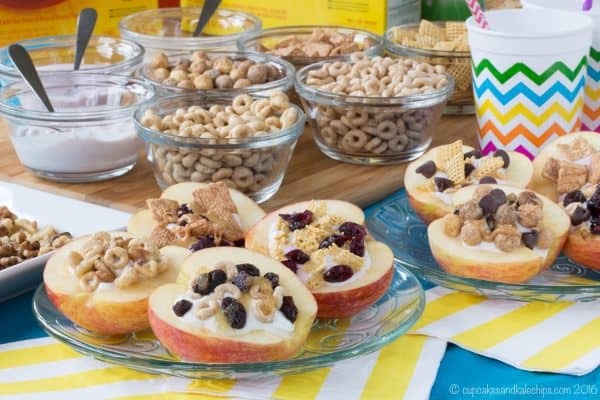 Be inspired by these eight ideas, or just put out a bunch of toppings to let the kids create their own favorite combos. 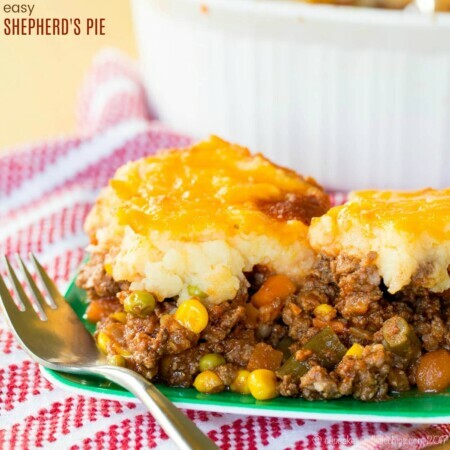 Disclosure: This recipe was sponsored by General Mills Cereal. Thank you for supporting the brands with whom I work, as well as supporting me in the partnerships that allow me to continue being able to create and share recipes with you through this blog. As always all opinions are my own. As my kids get older, it feels like summer gets shorter and shorter every year. One school year has barely ended when it already seems like we have to start thinking about the next one. While summertime often means the kids want to be munching on something pretty much all the time, there is still a more casual freedom to our daily life. When it’s back-to-school time, it’s also back to schedules and routines, and yes, a little craziness. And I don’t know about you, but The Bug comes home from school and he is huuuuunnnnngry. With lunch around noon and then not stepping off the bus till a little past four after a busy afternoon of learning and playing, the only thing on his mind is what he is going to eat. So this means I have to plan ahead or the most readily available option might not be the most nutritious choice. If I don’t, he’s getting whiny, I’m getting anxious, I just grab something because we have to run out to pick up Little Dude, and then I realize that maybe it wasn’t the best choice, and now I’m feeling the dreaded mom-guilt. 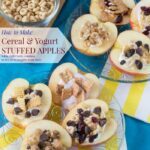 Cereal and Yogurt Stuffed Apples are going to be the kids new favorite snack! 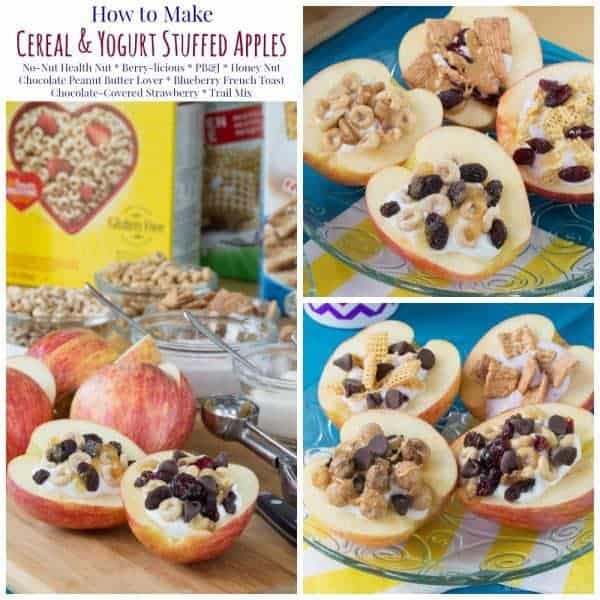 We’ve been making Cereal and Yogurt Stuffed Apples for awhile now, so I was thrilled to team up with General Mills Cereals to share this fun recipe idea with all of you. It seems that at the beginning of a new school year, families get overwhelmed and have to readjust all of their priorities. But putting your family first and feeling good about your choices, from what activities the kids get involved to what you pack in their lunchboxes or prepare as an after-school snack, is so important to a happy and healthy family. And speaking of those activities, when you are running around like crazy, you need to be prepared so that you aren’t reaching for the candy bars or grabbing some fast food. That’s where General Mills Cereals fit in perfectly, especially since they’ve started their journey to make their cereals even better. Sure, they already contained plenty of whole grains and key vitamins and minerals that growing kids need, but they are well into their efforts to remove all artificial flavors and colors from artificial sources. So that means some of the delicious flavors and bright colors are coming from ingredients like cinnamon, cocoa, fruit and vegetable juice concentrates, spice extracts for color, and more. Then when you add apples, yogurt, and favorite toppings like raisins, peanut butter, nuts, or yes, maybe even a chocolate chip or two, you can make a snack (or heck, even a breakfast), that the kids will love, and you’ll love knowing that they are getting the nutrition they need from something that they are going to be happy to eat. 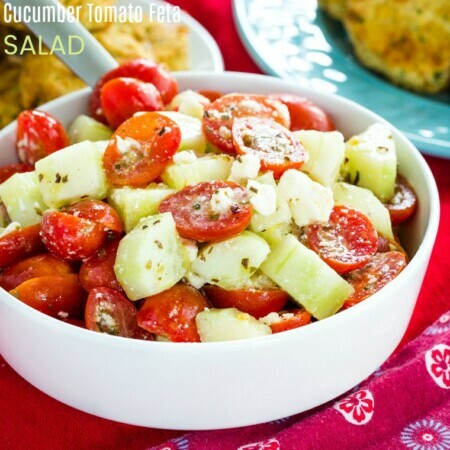 Simply put together one or two for your own kids, or put out a platter of fixin’s if everyone from the neighborhood is coming over to play – you can easily offer gluten free, nut free and peanut free options too. It’s so simple and you’ll save your sanity when you are running from the bus stop to soccer practice to piano to swimming to chess club if you have a strategy to satisfy those after-school snack attacks fast! Slice those apples in half, scoop out the core, and fill ’em up! I’ve given you eight ideas to get you started, but feel free to come up with your favorite combinations for a snack that’ll disappear faster than you can say “Back to School”. I hope you’ll give these a try and remember my key tip for putting yourself first this year to stay a little more sane and confident is to Have Easy, Wholesome After-School Snacks Ready for Hungry Kids. And if you have leftover cereal after making these, you can make a bunch of other snacks. Cranberry Pistachios Snack Mix form Family With Foodie is perfect any time of the year. 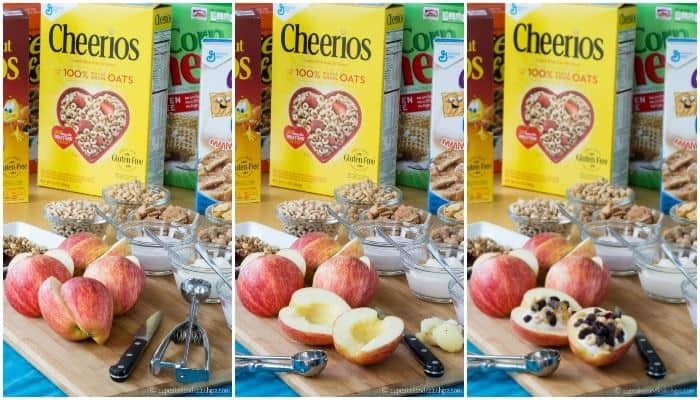 It’s made with Cheerios and even Greek yogurt, and has a nut-free option. Very Berry Frosted Cheerios Snack Mix is totally poppable. Why? Because it has popcorn, of course. Homemade Chex Mix from Big Bear’s Wife is always a classic. 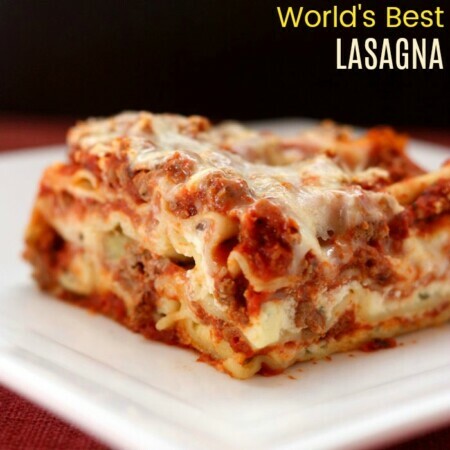 Perfect for a Savory Snack. And if you have Star Wars lovers, C-3PO Bites from Dinners, Dishes and Desserts will make them happy. It’s a galactically good treat. What is your key tip for parents as the new school year approaches? Your favorite toppings such as dried fruit, nuts, honey, chocolate chips, peanut butter, etc. Slice apple in half. Using a melon baller, small scoop, or paring knife, scoop out the seeds to make a "bowl". Then cut out any remaining core with a small paring knife. 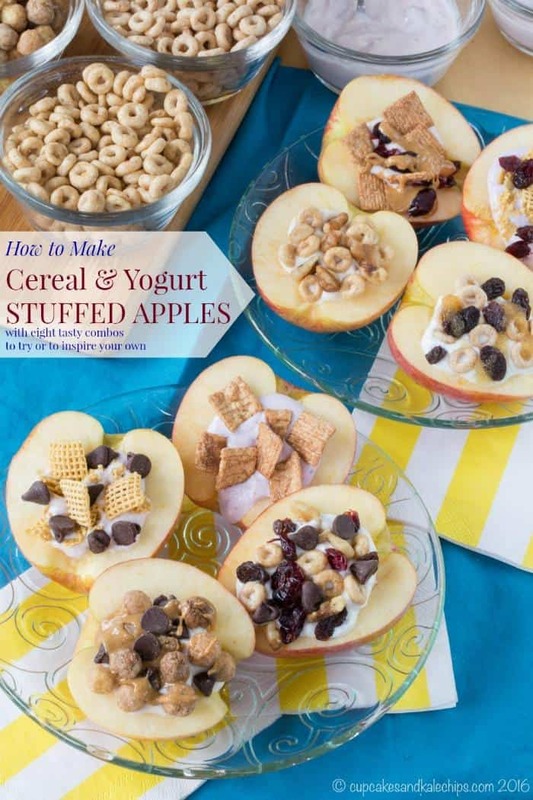 Fill each "bowl" with yogurt, then top with your favorite cereal and toppings. Such a fun idea! I know my son would love it! Thanks so much for joining us at Delicious Dishes! 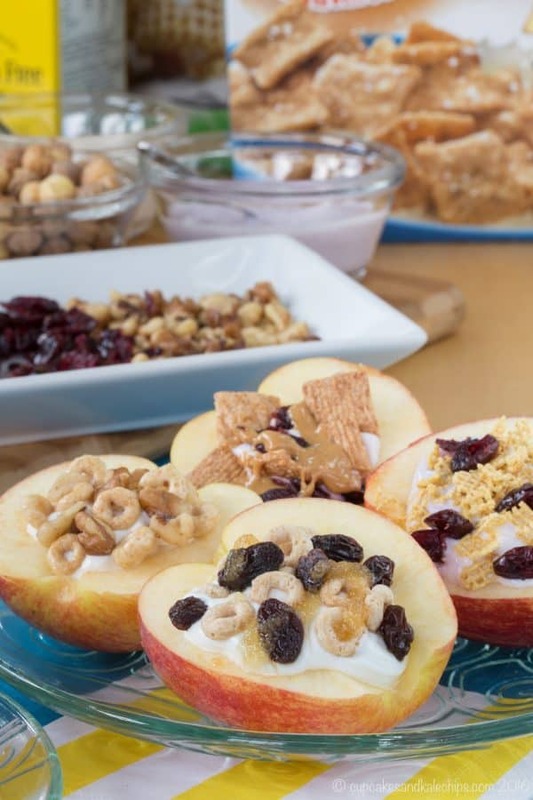 We love your Cereal and Yogurt Stuffed Apples recipe and hope you’ll join us again this week! What a fantastic idea! My kids would love these! We’d be honored if you’d share this at our weekly link party. Brianne, I LOVE these!!!! what a great idea!!!! 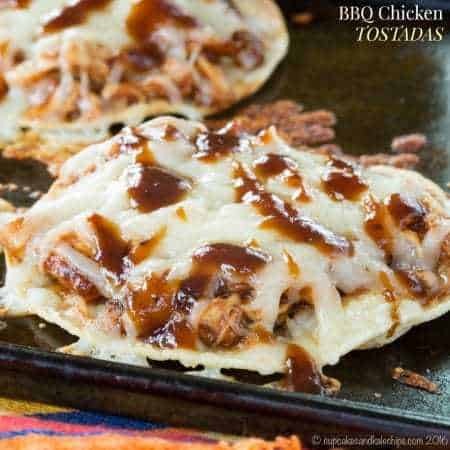 totally going to make these! These are SO cute and proof that cereal makes EVERYTHING better! This is so darn creative! Love this! Such a simple, yet perfect treat for kids! How fun are these apples?! Love this!! This is such a great idea!! And we love all those cereals!